Breaking: Arctic Ice Breaks Up in Beaufort Sea. For the record—I do not think that any sea ice will survive this summer. An event unprecedented in human history is today, this very moment, transpiring in the Arctic Ocean. The cracks in the sea ice that I reported on my Sierra Club Canada blog and elsewhere over the last several days have spread and at this moment the entire sea ice sheet (or about 99 percent of it) covering the Arctic Ocean is on the move. Clockwise. The ice is thin, and slushy, and breaking apart. Humans have benefited greatly from a stable climate for the last 11,000 years or roughly 400 generations. Not any more. We now face an angry climate. One that we have poked in the eye with our fossil fuel stick and awakened. And now we must deal with the consequences. We must set aside our differences and prepare for what we can no longer avoid. And that is massive disruption to our civilizations. The NOAA VisLab uses the imagery from NOAA‘s weather and climate satellites to produce animations that show the dynamic nature of Earth and its environment. A series of intense storms in the Arctic has caused fracturing of the sea ice around the Beaufort Sea along the northern coasts of Alaska and Canada. 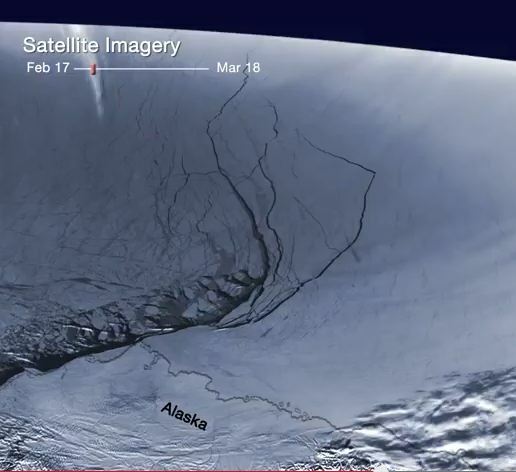 High-resolution imagery from the Suomi NPP satellite shows the evolution of the cracks forming in the ice, called leads, from February 17 — March 18 2013. The general circulation of the area is seen moving the ice westward along the Alaskan coast. Paul Beckwith is a PhD student with the laboratory for paleoclimatology and climatology, department of geography, University of Ottawa. He teaches second year climatology/meteorology as a part-time professor. His thesis topic is “Abrupt climate change in the past and present.” He holds an M.Sc. in laser physics and a B.Eng. in engineering physics and reached the rank of chess master in a previous life.